Drawing amazing and mystifying power from high in the Bhot (Tibet), the Bhote Koshi River,gushes into Nepal through breathtaking valleys like a venomous snake. Glacial water from the 10th Highest Mountain in the world, Shisa Pangma carves a steep and direct drop at the top that gradually eases to more placid streams and calmer pools within a 46 kms run at the Lamosangu dam. The rapids over here are a solid class IV- V at high flow and a more classic III at lower levels. 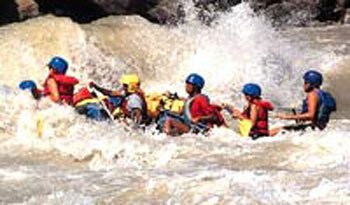 Continuous, challenging and action-packed, the Bhote Koshi offers nothing less than the ride of a lifetime. If you have never rafted before and if you have limited time but desire an adrenaline overload, then this is an ideal introductory trip package for you. If you are looking for a fantastic setting then the thrilling drops, gorges and limestone formations will welcome you into another dimension where your instinct becomes your driving force and your body is your best ally. Both experienced and novice paddlers will agree that this is a unique experience.